There are green tomatoes in the vegetable garden. I'm waiting for them to turn red. I'm anticipating the first big ripe tomato. I'm looking forward to eating it. 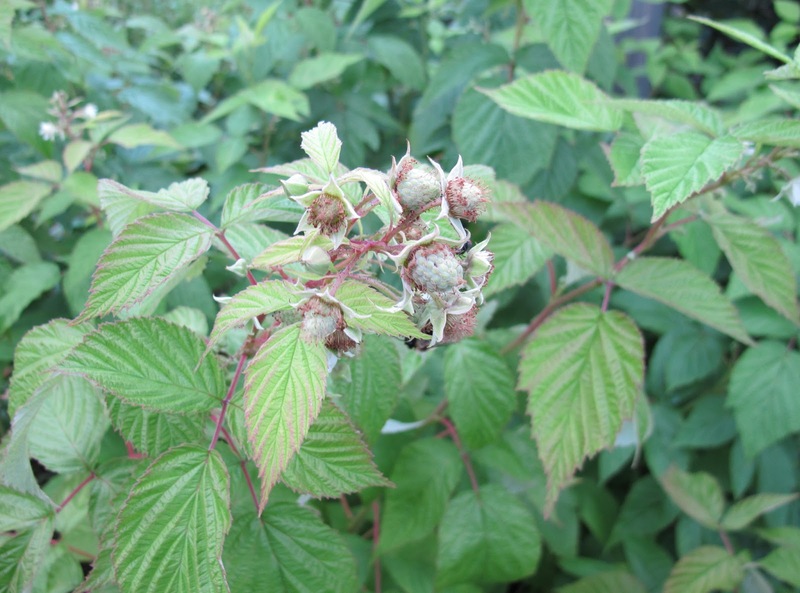 The golden raspberries are almost gone, but the red raspberries are like green jewels ready to ripen in the sun. I am waiting for the morning when I can pick the first ripe red raspberry. I am anticipating how good it will taste. I'm looking forward to picking bowls of raspberries to share to eat. The sweet corn is tasseling and the silks are showing. I'm waiting for those first ears of corn to fill out. I'm anticipating how sweet that corn will be when I pick it. I'm looking forward to eating it. I'm waiting for a special old gardening book to arrive in the mail. I am anticipating what will be between its covers. I'm looking forward to telling readers about it. I'm good at waiting, good at anticipating and good at looking forward. Why? Because I'm a gardener. This post has me HUNGRY. Isn't the garden the original and still the best fast food restaurant? Yes, we are the most patient!!!! I have harvested some grape tomatoes, but I await the larger green tomatoes. Patience is the virtue all gardeners share. Looks like a bountiful harvest is in your future, Carol. Carol: Your interest and enthusiasm on gardening are a blessing to your readers. Keep up the good work. Experienced gardeners have learned to be patient because things don't happen any faster whether you're patient or not. But new gardeners are impatient. The garden itself trains them. And the best part--for gardeners, anyway--is that once the waiting's over there is always something else to look forward to! Well yes, that's what gardeners do best, wait. Just think of the bulbs we plant in the fall, knowing we have to wait till spring to see them. My veggie garden is small but prolific this year, but still waiting for the ceremonial eating of the first tomato. Mmmmm. those are some good looking tomato plants! My son was just asking me yesterday as he was admiring his tomatoes - when are these going to turn red!